Kpop-Infinity ♥ OUR INFINITE LOVE ♥: Kim Hyun Joong’s contract comes to an end. Leader of SS501, Kim Hyun Joong is currently under a stressful dilemma with the end of his contract quickly approaching. Kim Hyun Joong’s contract with DSP Entertainment will officially end on June 8th. There are rumors that he will separate from the other SS501 members and pursue an acting career. However, there are also opposing rumors that all the members of SS501 and the company have unofficially renewed the contract. 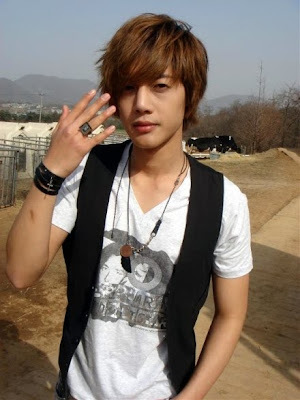 Furthermore, it is well known that Kim Hyun Joong is best friends with TVXQ’sJaejoong. An unknown source said that there was a possibility that Kim Hyun Joong will enter Jaejoong, Micky, and Junsu’s current company. In fact, it’s been said that Hyun Joong and Jaejoong are currently living together, so rumors has it that the two best friends are currently cautiously contemplating about Kim Hyun Joong’s future. Another source claimed that Kim Hyun Joong will leave DSP Entertainment, but will continue to be a part of SS501 and participate in their promotions and activities. This is similar to what the members of Shinhwa are doing right now. god also had a period when the members were in two different companies. DSP Entertainment is currently trying to compromise with Kim Hyun Joong by saying that they will be fully supportive of his acting career while he is still a part of SS501. There are too many rumors and speculation to know what Kim Hyun Joong will decide. We will have to wait until June for his final decisions! Fully Taken out without editing..